Such is the strength of the market in Bangkok that prices are guaranteed to not stay this low for much longer. In year to the end of March 2013, prices of condominiums in Bangkok rose by a remarkable 9.39%, making Bangkok one of the fastest-increasing markets in South East Asia. Due to the country’s fast economic growth, forecasters predict that the property boom in Bangkok is still at the beginning as the economy continues to increase at levels faster than neighbouring countries, with the country’s GDP increasing by 6.44% in 2012 and steady increases since. The upwards trajectory of Bangkok’s property prices are set to increase still further when the ASEAN Economic Community which offers tariff-free trade and visa- free travel between all member countries comes into effect at the end of 2015. 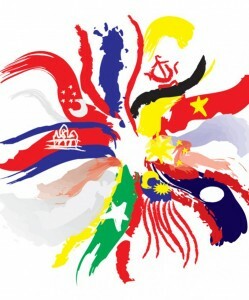 Due to Thailand’s position right in the centre of the ASEAN region – at its very crossroads – Thailand is expected to benefit more from the introduction of the new trading zone than most of the other member nations. 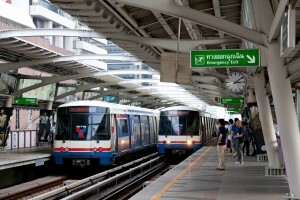 The expansion of Bangkok’s Skytrain network is fuelling the city’s real estate boom. Much of the activity in the real estate market is centred around developments located within easy reach of stations on Bangkok’s mass transit system, which now makes it easy to navigate the often heavily-congested streets of Thailand’s capital city. The network, which comprises the underground, Skytrain, bus and rail networks, is seeing massive expansion over the next few years with the number of lines increasing from eight to 15. As new stations are announced, so new areas of the city become attractive areas to live. 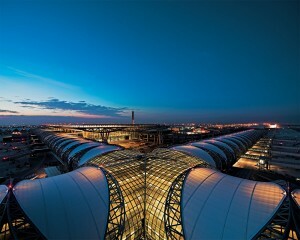 With its brand new Suvarnabhumi International Airport, Bangkok has become one of Asia’s main transport hubs. In fact, a recent survey conducted by MasterCard found Bangkok International to have recently overtaken London’s Heathrow as the world’s busiest international airport. Tourist numbers to the city are increasing rapidly – visitor numbers were up 18.6% year-on-year in the first quarter of 2013. Much of this increase came from China, where over 2 million tourists arrived in the first half of 2013 alone, an increase of 95.06% over the same period in 2012. Chinese visitors are now by far the most numerous visitors to Thailand, accounting for 21% of all international arrivals. There are also increasing visitor numbers to the city from the Gulf area. The Abu Dhabi to Bangkok route is Etihad’s busiest, having transported 700,000 passengers to the city in 2012. The airline is now adding a sixth flight per day to the city in order to cope with the constantly increasing demand. The new high- speed rail link to the airport makes it possible to reach the centre of Bangkok from Suvarnabhumi in under thirty minutes. Furthermore, the old Don Muang International Airport serves as a highly efficient terminal for domestic flights so air travel infrastructure is highly developed in the city. According to research published by Global Property Guide in April 2013, rental yields in Bangkok range from 3.97% to 7.41%. This makes Bangkok the third best-performing capital city in East Asia after Manila and Jakarta – another sign that there is still plenty of capital appreciation left in the market for condominiums. Smaller apartments earn much higher rental yields than bigger apartments. 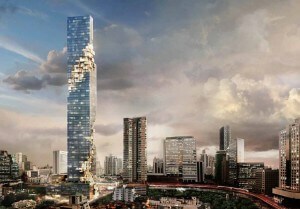 A 50m2 apartment in Bangkok’s central location earns good rental yields at 6% -7% per year. The rental yields from medium-sized apartments are also good. An 80m2 apartment earns moderate to good rental yields at 6.86%. The same can be said about 120m2 apartments, where rental yields have increased to 6.53% from 6.49% the previous year. 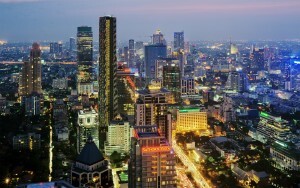 Currently foreign buyers make up a relatively small proportion of the total market for condominiums in Bangkok, but this situation is changing fast as well-informed investors realise that there is little growth left in most of the key Asian cities and begin to look further afield to see good returns on their investments. Bangkok attracts not only investors – it also attracts foreigners looking for a second home in a vibrant and affordable city, in a country which is well-known for the warm welcome by the country’s friendly and hospitable people. That’s the reason why Thailand is known around the world as ‘The Land of Smiles’ Bangkok’s shopping malls, climate, cuisine and nightlife make it a Mecca for tourists. The city is now a highly cosmopolitan one which welcomes visitors from all over the globe. Visitors are attracted not only by the legendary Thai hospitality, but also its world-famous cuisine, year-round warm and pleasant tropical climate, thrilling nightlife opportunities, low-cost shopping in the city’s many large, modern shopping malls and beautiful temples and other tourist attractions. 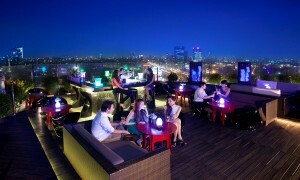 English is widely spoken in the city and Bangkok also has a sizeable Thai-Chinese population.